Though little thought is sometimes given to industrial buildings as architecture, the former Star Mill complex on East Main Street in Middleborough is one of the community's most significant structures architecturally speaking. It is the most intact 19th century manufactory remaining in Middleborough, and likely one of the few remaining brick woolen mills dating from that period still extant in southeastern Massachusetts. The evolution of both the woolen industry in the 75 years following the construction of the original Star Mill as well as the subsequent industrial uses to which the mill was put are admirably documented in the additions which were periodically constructed onto the building. While the role of Solomon K. Eaton as architect of Middleborough Town Hall has long been recognized, Eaton’s other contributions to the built landscape of Middleborough have been long overlooked, as has Eaton’s place in the development of a particularly New England architectural idiom in southeastern Massachusetts during the mid and late 19th century. Sadly, in fact, while many Eaton-designed buildings remain, few have been able to be definitively attributed to him for lack of records. One industrial building in Middleborough, however, for which Eaton was responsible was the Star Mill which was designed by Eaton and his business partner at the time, Obed Smith, and raised in 1863 for the manufacture of woolen cloth. The Star Mill complex at Middleborough was Eaton’s most significant work and largest commission since his New Bedford commissions of the mid-1850s which included Liberty Hall and a design for the New Bedford Free Public Library, the first of its kind in the nation. Though located in Middleborough, Eaton’s native town, the Star Mill project was financed by New Bedford parties headed by Loum Snow who were undoubtedly aware of Eaton’s status as a local architect. Though Eaton had previously designed industrial structures, the Star Mill may in fact represent his most extensive foray into the field of mill architecture. 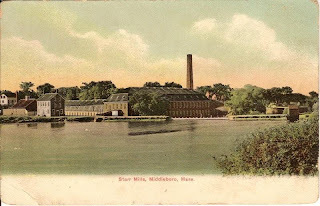 At a time when mill design and construction was becoming an increasingly specialized field, the Star Mill appears visibly distinctive in contrast to contemporary textile mills elsewhere, most particularly with its large hipped-gable or pontoon-style roof (which provided additional usable workspace on the uppermost floor of the structure). Undoubtedly Eaton & Smith were responsible for the entire c-shaped complex of mill buildings. The main building was the three-story brick and frame pontoon roofed finishing building measuring 163 by 48 feet. Attached upon its end was a smaller 72 by 32 foot brick hip-roofed building (capped with a small cupola) utilized for wool scouring, dyeing and drying. From this latter building, a narrow one story gable roofed building extended perpendicularly towards Main Street. This structure was being used by 1885 to house the mill office and “drug room” or infirmary. At the opposite end of the main structure was a large 169 by 187 by 36 foot two-story brick and frame pontoon roof spinning and weaving building. The building had a twenty-four inch brick wall to the top of the first floor and a frame arched truss roof on the second floor. To help stabilize the structure, the main mill included cross tension rods to brace the manufactory which was subject to the vibrations created by the machinery which filled the building. With machines working at full throttle, mechanical vibrations had the ability to wreck a building. Such was the knowledge gained by the devastating collapse of the Pemberton Mill at Lawrence in January, 1860. 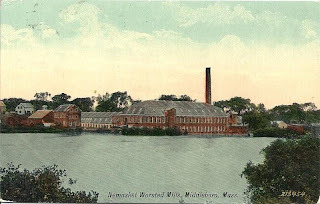 At the time of the disaster, the New Bedford Republican Standard described the Pemberton Mill as never having “been considered as staunch as it ought to have been. It was built about seven years since, and was then thought a sham; indeed before the machinery was put in, the walls spread to such a degree that some 22 tons of iron stays were put in to save the building from falling from its own weight”. Similar occurrences were known closer to home by Eaton. On March 3, 1860, the western end of a three-story wood-frame building owned by William J. Rotch, A. H. Howland and William P. Howland on Fish Island at New Bedford collapsed under the weight of some 8,300 bushels of wheat stored on the second floor by the New Bedford Flour Mill Company. The building had been erected upon pilings and it was believed that insect damage had so severely compromised the structural integrity of the building that it precipitated the collapse. Accordingly, Eaton designed the Middleborough woolen mill to incorporate these stabilizing rods. At the Star Mill, these rods (as elsewhere) were capped with decorative iron work visible on the exterior of the building, in this instance small stars. While some have claimed that the shape of these decorative finials gave their name to the Star Mill, it is more likely that the star motif was selected to reflect the name of the corporation which predated it. Eaton’s Star Mill was an immediate success, and garnered notices in the local press, including an extensive review by a correspondent of the Middleboro Gazette who toured the structure upon its completion. As natural with an industrial structure the nature of the Star Mill, the building was added to and updated frequently throughout its long history. Fortunately, Winthrop-Atkins maintained the structure as an important architectural asset and an example of Middleborough’s best known architect’s lesser known (though no less significant) work, a perfect complement to Middleborough Town Hall. The Star Mill site is comprised of a number of interconnected buildings constructed between 1863 and the mid-twentieth century. The main mill building is this three-story pontoon-roofed structure adjoining the former river which measures 163 by 48 feet with a 15 by 12 addition. The building is most readily recognizable by its unusual and expansive pontoon roof. The roof is so large, in fact, that when it was reshingled in late 1905, 125,000 shingles were required for the task. The building was most frequently referred to as the Finishing Building as it was here that this process (along with several others) was initially carried out by the Star Mill. The western-most three quarters were occupied by gigging, fulling, finishing, washing, spooling and dressing operations which were all located on the first floor, mule spinning and carding on the second floor and mule spinning in the attic. The remaining eastern portion of the building housed wool and cloth drying on the first floor and the picker house in the attic. Following the construction of the new engine house in 1886, the picker house was relocated there from the attic of this building. The Farwell Mill employed the building for similar purposes, with a weave shop of the ground floor and carding and spinning operations on the upper floors. The Nemasket Woolen Company reorganized the layout of the operations in the Finishing Building sometime before 1912, and most likely immediately after 1906, locating its finishing room on the first floor, a weaving room on the second and winding and spooling operations on the third. This layout remained in place until the mill closed. The original power sources for the entire mill were also situated in the Finishing Building, thereby reinforcing its primacy within the complex. The original flume was located at the western end of the building through which water was drawn from the mill pond to turn the water wheel. The wheel was a seven-foot turbine wheel manufactured by Kilburn, Lincoln & Son of Fall River. In September, 1879, the mill installed a new vertical water wheel which necessitated the temporary shutdown of the mill. (In 1900, this water wheel was removed as it had "become unfit for work"). Complementing the water wheel was an engine room with boilers and an attached 60-foot chimney which were located at the southeast corner of the Finishing Building. Because of this use, this portion of the building surrounding the original engine room (and including the picker house) was clad with iron sheets to reduce the risk of any fire spreading to the remainder of the mill. To fuel the boilers, the mill purchased coal which it stored on the opposite bank of the river. Coal was retrieved by means of a small car which crossed the river on a track. The original boilers were replaced by a new engine house in the spring of 1886, at which time a new coal pocket was established outside the mill. The building was utilized by Winthrop-Atkins following 1944 for manufacturing and was most recently used as warehousing for its Housh Company division on the first floor, blank storage on the second floor and miscellaneous storage on the third floor. The two-story brick Star Mill Drying Building measuring 72 by 32 feet was attached to the eastern end of the Finishing Building. Here wool was sorted, scoured and dyed. The Star Mill’s original dye house was located in the western end of the Drying Building and it was here that the scouring operation was also performed. The eastern portion of the Drying Building and the attic was occupied by the sorters. As the Farwell Mill which occupied the plant after 1899 did not produce its own yarn, purchasing from manufacturers elsewhere, the processes of scouring and dyeing were no longer performed at the mill permitting the Drying Building to be given over to other uses. Here on the first floor, Farwell located its dresser room, using the attic for storage. When the Nemasket Woolen Mill resumed spinning, the Drying Building returned to its previous role with fulling and dyeing performed on the ground floor as well as in an addition constructed onto the rear of the building sometime between 1906 and 1912. Nemasket employed the second floor for additional weaving space and the attic for spinning and winding. Following construction of a new dye house in 1918 and its expansion two years later, the drying and dyeing operations were removed from this building. Most recently, the building served as carton storage for Winthrop-Atkins. The roof of the Drying Building was notable for having been the location of a square cupola which housed the mill bell. The Star Mill bell was “the rising bell for villagers and suburbanites since the plant was built”, and was rung thrice daily: at 5:30 a. m., 6:30 a. m. (at which time all operatives were expected to be at their machines) and at 6 p. m. when the mill stopped for the day. The bell was replaced in January, 1908, by a six-inch steam gong. The new gong “created some wonderment on the occasion of its initial performance” on January 20. A brick one and one-half story gambrel-roofed wing measuring approximately 6o feet long by 18 feet extends perpendicularly towards East Main Street from the northeast corner of the Star Mill Drying Building. Divided into two equal portions, the wing originally housed the Star Mill office in the section closest to the street and a “drug room” which acted as the company’s infirmary in the rear. At one time, prior to Middleborough’s establishment of a municipal waterworks in 1885, the Star Mill office was the location of the town’s rain gauge which provided official precipitation readings. About 1899, the Farwell Mill converted the drug room into a yarn room, and the infirmary presumably was relocated to elsewhere in the complex. For a time, the Nemasket Woolen Company also used the former drug room space as a yarn room, though it continued to maintain its offices in the front of the building facing East Main Street until 1920 when a new brick office building was erected midway between its former location and the new 1920 Weave Shed. At that time, a small “hospital” was established in the abandoned office to accommodate workers’ needs. Interestingly, the original Star Mill office was used most recently by Winthrop-Atkins for a similar purpose. 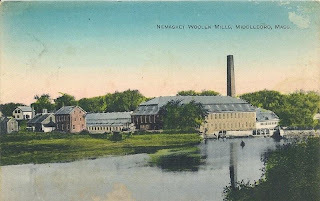 Some time between 1906 and 1912, a wood frame fulling and dye house was constructed by the Nemasket Woolen Company onto the rear (south side) of the Star Mill Drying Building in order to facilitate its resumption of yarn production. It was there that dyeing operations were performed with the high-grade dyes favored by the firm. This structure was replaced in the spring of 1918 by a 17 by 71 foot brick Dye House and Fulling Mill addition constructed by Middleborough contractor Fred C. Sparrow. This space, too, soon proved inadequate in accommodating the company’s dyeing operations and a new one-story flat-roofed brick dye house measuring 88 by 29 feet was constructed onto the east side of the complex adjoining the 1918 Dye House, the Star Mill Drying Building and the Office and Drug Room wing. Winthrop-Atkins used this space for the location of its presses one of which stands outside the building. Due to the unreliability of the power provided by the Nemasket River, this addition was constructed in the spring of 1886 to reduce reliance upon the river. An earlier power plant with a 60 foot high stack had originally stood at the southeast end of the main finishing building, but was made obsolete with the completion of this addition which consisted of a 2-story brick boiler house measuring 26 by 37 feet and an adjoining engine house 44 by 17 feet. The brick addition was clad on the interior with iron to reduce the risk of fire to the remaining complex. This addition also was known as the Picker House as the picking room was relocated to the second floor from the attic of the main Finishing Building. The engine room was somewhat inconveniently sited, being located as it was at the bottom of Star Mill Hill. In March, 1912, a heavy rainstorm, deluged the town with nearly three inches falling in a short period of time. The run off from the hill poured into the engine room and wheel pit, temporarily halting production and damaging goods in the process of manufacture. In the fall of 1906, a new 14,940 pound 100 horsepower boiler was installed in the boiler room and an additional two “high power” boilers were placed two years later in July 1908 which necessitated closure of the mill for two week’s time. Probably during the occupancy of the Farwell Worsted Mill, a dynamo was added to the complex in order to provide electrical lighting. 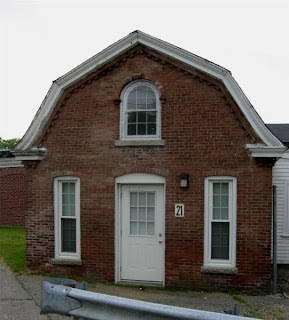 In 1910, the Nemasket Woolen Company constructed a brick dynamo room measuring 34 by 14 feet onto the west side of the power plant addition in the corner formed by the 1886 engine house and the Finishing Building. The dynamo, which had previously been situated in the northeast corner of the Finishing Building, was relocated into the new fireproof room, thereby making space for additional machines in the finishing room. Marking the location of the complex’s power plant is the square tapering smokestack which was constructed of bricks manufactured in the Sampson brickyards in Middleborough. As built, the chimney originally stood 100 feet tall, but by 1928 was recorded as having been only 90 feet, and since has been further reduced in height due to safety concerns. The Power Plant addition remained in consistent use in the capacity for which it was built. The two-story brick and frame pontoon-roofed Weaving and Dressing Building measures 169 by 187 by 36 feet and extends perpendicularly from the west end of the Finishing Building. Constructed to withstand the heavy vibrations caused by the simultaneous operation of numerous power looms, the Weaving and Dressing Building has 24-inch brick walls to the top of the first floor and a frame arched truss roof on second floor. 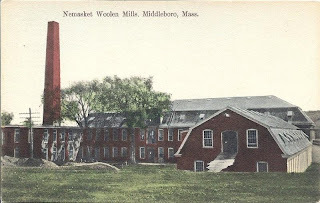 The structure was utilized by both the Star Mill and the Farwell Worsted Mill for weaving (on the first floor) and spinning (on the second), while the Nemasket Woolen Mill similarly used it for weaving and dressing. At some time between 1885 and 1891, the business of the Star Mill warranted the construction of a shed-roofed extension along the west side of the Weaving and Dressing Building in order to accommodate additional looms. The extension was constructed between the existing building and a five foot high retaining wall that separated the building from the nearby Repair Shop. The resulting extension consequently sat partially underground with a roof six feet above ground. In August, 1900, this loom shed was torn down to give more light in the main weaving room situated on the ground floor of the Weaving and Dressing Building. High levels of light were required in weaving as completed cloth taken from the looms was inspected prior to being sent to the Finishing Room. At one time the Weaving and Dressing Building was connected to the Repair Shop by a belt box which housed leather belting by means of which power was transferred from the mill to the shop’s machinery. The building was most recently utilized by Winthrop-Atkins for warehousing on the ground floor and imprinting and assembly on the second floor. This addition was constructed as part of the 1920 Nemasket Woolen Mill expansion to connect the earlier Star Mill Weaving and Dressing Building (1863) with the new Weave Shed (1920). The addition was used to expand the operations of the adjoining Weaving and Dressing Building, and was later used for the Walker Company’s receiving department. Under Winthrop-Atkins, it remained used for receiving purposes and as a link between the two portions of the complex. This one-story brick modern daylight weave shed measuring 143 by 71 feet was constructed in mid-1920 by the Casper Ranger Construction Company of Holyoke and Boston to house 40 new Crompton & Knowles 82-inch box looms, all electrically-powered, which were to be devoted to the production of plain and staple goods by the Nemasket Woolen Mill. The large steel-sash windows of this building were a concession to its function, as was the clerestory which ran the length of the roof, as large amounts of natural daylight were required by weavers in their work, and particularly for the inspection of their finished product. As late as 1970, the interior of the building was still described as “light and airy”. Later the building housed the manufacturing operations of the Walker Company, and it was here that ice bags, electric heating pads and other items were produced. The building was most recently used for storage by Winthrop-Atkins. The office building – a one story brick structure measuring 50 by 25 feet - was built in 1920 to replace the earlier office which was housed in a portion of the 1863 mill building. As constructed, with three offices and two washrooms, the office stood on East Main Street midway between the 1863 ell which housed the original Office and Drug Room of the Star Mill and the 1920 Weave Shed. Later, in 1944, the office was moved a short distance uphill and connected to the southeast corner of the Weave Shed which was then occupied by the Walker Company. It housed the personnel department of Winthrop-Atkins. The two story and attic brick Repair Shop measuring 37 by 20 feet was originally a free-standing structure located to the west of and parallel to the Weaving and Dressing Building. 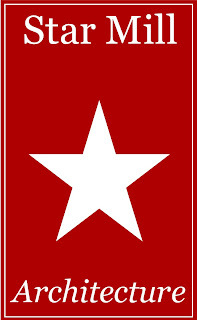 During the ownership of the Walker Company, a portion of its structure was “built into the Walker plant”. The Repair Shop housed the mill’s carpenter and blacksmith shops on first floor, machine shop on second floor and storage in attic. The one-story brick Gas House measuring 44 by 29 feet with arched truss roof and concrete floor appears, like the Repair Shop, to have been incorporated into later additions made by the Walker Company. Certainly it was standing in mid-1928 when it was included in the auction of the Nemasket Woolen Company’s real estate. Initially constructed to produce gas with which the mill buildings could be illuminated, the Gas House was made redundant when the Farwell Mill installed a dynamo in the Finishing Building and introduced electric lighting into the complex. Subsequently, the Gas House was put to use as a shipping building, and it was in this building that the woolens produced by the mill were prepared for shipping, either crated or wrapped in water-proof paper and burlap. Following its acquisition of the 1920s portion of the Star Mill complex, the Walker Company made a number of additions including a 68 by 68 foot brick addition on the rear of the original Walker Company building which last housed carton seal and storage for Winthrop-Atkins, a large 80 by 185 addition constructed at a 90 degree angle to the rear of the Walker Company addition mentioned above which was last used by Winthrop-Atkins for a calendar warehouse, and an 80 by 80 addition on the south end of the above-named calendar warehouse. The architectural detail displayed in the original office of the Star Mill indicates that the Star Mill was intended for more than just a utilitarian workplace with no aesthetic value. 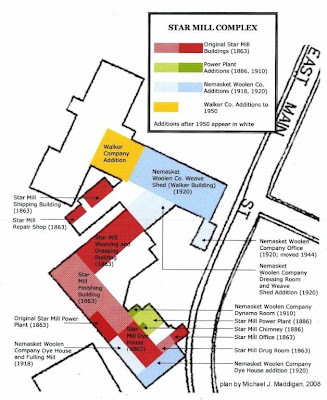 The plan shows the expansion of the Star Mill building following 1863. This view is historically the most frequently captured of the Star Mill and was reproduced in numerous photographs and picture postcards. The view shows the Gas House on the far left, the two and one-half story Repair Shop at left center, the long low-roofed Weaving and Dressing Building, and the main Finishing Building from across the expanse of the Mill Pond. The 1833 Lower factory dam which impounded the pond’s waters is visible directly in front of the right end of the Finishing Building. Water was drawn into the mill through a flume situated on the west end of the Finishing Building and from there power was transferred throughout the complex through means of wooden (and later steel) shafting and leather belting. Because the water flow proved erratic, it necessitated the use of a governor to regulate the mill’s drive shaft. This view depicts the rechanneling of the Nemasket River in the rear of the Star Mill. The building appears remarkably unaltered from its appearance some sixty years earlier. The primary differences are the addition of ventilators on the roof ridge of the mill and the shortening of the factory smoke stack for safety reasons. In order to create a large enough parcel of land to accommodate a proposed $500,000 expansion by Winthrop-Atkins, a 545-foot portion of the Nemasket River was re-routed through a new channel some distance from the former Star Mill complex. Peat from the former river bed was dredged and replaced with more solid fill. Eighty-six year old Grace Clark, a columnist of the local Middleboro Gazette was dismissive of the project. “Will you tell me why the river has to be changed so an addition can be put on? Fooey – never heard of such nonsense.” Despite such objections, the project moved forward and in May, 1965 work commenced on relocating the river. The photograph depicts the flat-roofed Nemasket Woolen Company's dye house addition of 1920. Behind it, the pontoon roof of the Star Mill's original dye house (with the brick gable) is visible. Upon the roof of this building, the original mill bell was located in a small cupola. Still further behind is the larger roof of the original Star Mill finishing building. The row of large windows facing East Main Street and the Winthrop-Atkins Building marks the Nemasket Company's dye house addition of 1920. Originally, two windows also faced directly upon East Main Street, but were bricked over during the final years of Winthrop-Atkins' operation. This view depicts the area formed by the Power Plant, Finishing Building and Weaving and Dressing Building. To the left in front of the chimney is the two-story engine house. In the angle of the walls formed by the engine house and the Finishing Building is the small one-story flat-roofed dynamo room. Just visible on the far right is the Weaving and Dressing Building. The small hipped-roof structure seen to the left of the tree is the housing which covered one of the mill’s hydrants. This view depicts the interior “courtyard” formed by the “C” shaped-layout of the former Star Mill buildings. The 1886 smokestack rises behind the Engine Room and Boiler House on the far left. In the center is the large bulk of the Finishing Building, while the gambrel-roofed Weaving and Dressing Building in which wool was spun on the second floor and woven on the ground floor is seen on the right. Piles of coal may be noticed at the left middle, and were kept in a “coal pocket” here after 1886. During the regional coal shortage in the winter of 1902-03, the Farwell Mill was forced to stretch its provisions of coal by mixing in sawdust so that it could maintain operations. Because slow business compelled the mill to operate on half-time only during this period, the coal shortage was not as harmful as may have been had the mill been operating at full capacity. The most conspicuous features of the Nemasket Woolen Company’s 1920 Weave Shed as seen from the south are the large steel-frame windows and the clerestory, both of which were designed to flood the interior of the building with light. Here, mill work was to focus upon the production of staple worsted goods, produced on 40 new 82-inch box looms which were to be electrically-powered. These looms, like the mill’s other looms, were supplied by Crompton & Knowles, a leading manufacturer of high quality mill machinery. On the left is the Dressing Room and Weave Shed addition which also was constructed in 1920 to connect the Weaving and Dressing Building with the new Weave Shed. 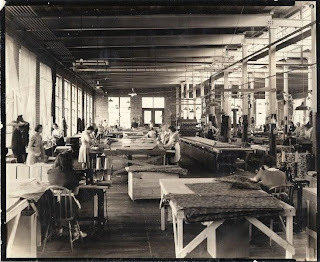 The view depicts the interior of the Nemasket Woolen Company's large weave shed addition of 1920 at a time when it was occupied by te Walker Company. The large light space was ideal for the process of weaving which required generous amounts of lighting. The building originally stood further south along East Main Street, but was relocated in 1944 by the Walker Company in order to improve shipping and receiving access to the interior of the complex. The Entire Holdings, Real Estate, Machinery, Equipment of the Nemasket Worsted Co. at Middleboro, Mass. Auction catalog. Boston: Samuel T. Freedman & Co., Auctioneers, June 28, 1928. --------------------. "Thomas Pratt's 'Start-up Technology' of 1803", Recollecting Nemasket, Middleboro Gazette, February 21, 2008. --------------------. "Solomon K. Eaton and the Star Mill", Recollecting Nemasket, Middleboro Gazette, January 10, 2008. Pratt, Rose and Ernest S., "The Old Star Millas I Remember It", Middleborough Antiquarian, 5:1. January, 1963, pp. 6, 7.